Product: Planet IGS-801M was added to cart. PLANET IGS-801M is an Industrial 8-Port Full Gigabit Managed Ethernet Switch specially designed to transmit reliable but high-speed data in heavy industrial demanding environments. It provides 8-Port 10/100/1000BASE-T copper interfaces delivered in an IP30 rugged strong case with redundant power system. Besides support for 16Gbps switch fabric to handle extremely large amounts of video, voice and important data in a secure topology, the IGS-801M provides user-friendly but advanced IPv6/IPv4 management interfaces and abundant L2/L4 switching functions. It is the best investment for industrial business expanding or upgrading its network infrastructure. With IP-30 industrial case protection, the IGS-801M provides a high level of immunity against electromagnetic interference and heavy electrical surges which are usually found on plant floors or in curb side traffic control cabinets. The IGS-801M also provides a wide range of power supply options suitable for multiple industries and for worldwide operation. The feature of operating temperature ranges from-10 to 60 degrees C allowing the Managed Industrial Switch to be placed in almost any difficult environment. The IGS-801M supports robust advanced features including IEEE 802.1Q VLAN, port link aggregation, QoS, broadcast storm control, IGMP snooping, and enhanced security to fit a variety of applications. Via aggregation of supporting port, the IGS-801M allows the operation of high-speed trunk combining multiple ports. A maximum of up to 4 ports of the IGS-801M can be assigned for 8 trunk groups and support fail-over as well. In addition, its standard-compliant implementation ensures well interoperability with equipments from other vendors. The IGS-801M is loaded with robust QoS features and powerful traffic management to enhance services to business-class data, voice and video solutions. The functionality includes broadcast/multicast storm control, per port bandwidth control, IP DSCP QoS priority and remarking. It guarantees the best performance for VoIP and video stream transmission, and empowers the enterprises to take full advantage of the limited network resources. PLANET IGS-801M offers comprehensive IPv4/IPv6 Layer 2 to Layer 4 Access Control List (ACL) for enforcing security to the edge. It can be used to restrict network access by denying packets based on source and destination IP address, TCP/UDP ports or defined typical network applications. 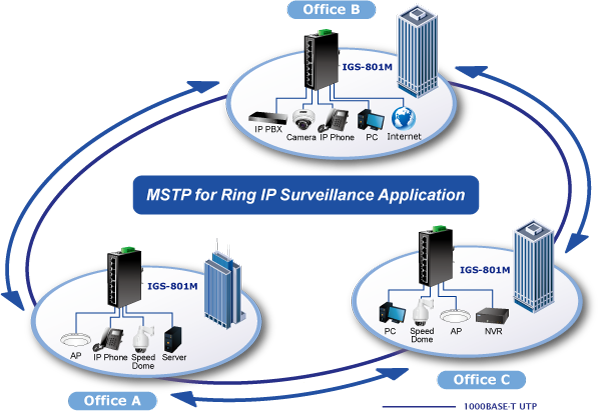 Its protection mechanism also comprises 802.1X port-based user and device authentication, which can be deployed with RADIUS to ensure the port level security and block illegal users. With the protected port function, communication between edge ports can be prevented to guarantee user privacy. Furthermore, port security function allows to limit the number of network devices on a given port. The IGS-801M also provides DHCP snooping, IP source guard and dynamic ARP inspection functions to prevent IP snooping from attack and discarded ARP packets with invalid MAC address. The network administrators can now construct highly-secure corporate networks with considerably less time and effort than before. For efficient management, the IGS-801M is equipped with web, Telnet and SNMP management interfaces. With the built-in web-based management interface, the IGS-801M offers an easy-to-use, platform-independent management and configuration facility. By supporting the standard SNMP, the switch can be managed via any standard management software. For text-based management, the switch can be accessed via Telnet. Moreover, the IGS-801M offers secure remote management by supporting SSH, SSL and SNMP v3 connections which encrypt the packet content at each session. The IGS-801M features strong, rapid, self-recovery capability to prevent interruptions and external intrusions. It incorporates Multiple Spanning Tree Protocol (802.1s MSTP) into customer’s automation network to enhance system reliability and uptime. The IGS-801M offers high performance and high reliability to make sure the continuous industrial operation in harsh environments such as control cabinet of transportation, factory floors, outdoor space, and the places where the temperature is extremely low or high. With a non-blocking design and desktop size, the installation of PLANET IGS-801M 8-port Gigabit Managed Industrial Ethernet Switch is as easy as that of a Fast Ethernet network and it is helpful to build a Gigabit high-bandwidth switched network quickly. To further expand the current network, the IGS-801M provides advanced Web and SNMP management interface to meet this kind of demand. With its built-in web-based management, the IGS-801M offers an easy-to-use, platform-independent management and configuration facility. The IGS-801M supports standard Simple Network Management Protocol (SNMP) that makes the managed switch able to be monitored via any standard-based management software. With the IGS-801M, which complies with all the requirements of industrial applications, customers may enjoy high reliability, recovery capability and safe Ethernet network operation. Er zijn geen faqs voor dit onderwerp.